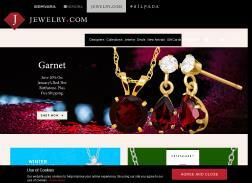 Jewelry.com is an online store that offers wide range jewelry products at affordable prices. Visit the website and browse through the products available by category such as rings, earrings, bracelets, and necklaces. The site also provides expert jewelry advice, shopping tips, and comprehensive jewelry education. Get Up to 94% off Singles Day Sale. Save on garnet and other red gemstone jewelry. Choose from 45 discounted gifts starting at $29. See link for eligible items. Get an extra 40% off Summer Clearance + Free shipping on all orders. Cyber Deals! Get 40% Off Select Styles. Curated Collection of 100 holiday gift ideas from Studs to Snowflakes and more. Get up to 85% off Premier Picks + Free Shipping. Get Special savings on Kabana designer jewelry, plus an extra 10% off when you buy 2 or more. Enjoy up to 50% and more off select gifts for guys. Limited time only. Enjoy up to 50% and more on select natural topaz gemstones. Limited time only. ST. Patrick’s Day Sale! Get up to 80% off Clovers, Green Gems, Claddagh Jewelry & more. Get 30% off Jessica Simpson Jewelry. Get an Extra 10% Off Any Order Of Two Or More items. Limited-time offer. 70% to 85% off 135 Cyber Deals. Click link for eligible items. Save on cocktail rings with coupon code. Save on select Kids Collection jewelry. Get 25% off your purchase with Student Discount when you register with Student Beans. Get 25% off all designer jewelry, including Sajen, Kabana, Van Kempen, Elle, Carolyn Pollack, and Jessica Simpson. Get Extra savings on blue jewels starting at $19.